Here’s how to keep America competitive: Cut government pay and benefits, so that private-sector work, which boosts the economy, becomes more attractive to top-notch talent. 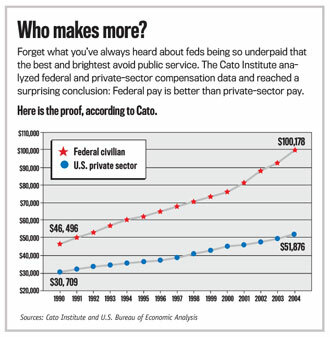 Edwards wrote that, in 2004, the average federal worker earned $100,178 in wages and benefits, compared with $51,876 for the average private-sector worker. Those numbers are from the U.S. Bureau of Economic Analysis data. In wages alone, federal workers earned an average of $66,558, which is 56 percent more than the $42,635 that the average private-sector employee earns. Besides high pay, the report states, the federal government offers benefits that are nearly extinct elsewhere: health insurance, a pension plan with inflation protection, a matching retirement savings plan, generous holiday schedule and a more relaxed pace of work. The ultimate perk: job security. Downsizing can come later. “As government air traffic controllers, space scientists and others retire in coming years, these activities should be handed over to the private sector so that they can be better managed and have more efficient compensation policies,” Edwards added. Click here to enlarge graphic(.pdf). At a Coalition for Government Procurement Partnership Dinner held in San Antonio, Texas, David Bibb, the General Services Administration’s acting administrator, described a scene from the filming of the movie “The Alamo” to illustrate a point. “Here’s something else that happened while they were shooting the film: A big battlefield scene was coming up… one of the extras grabbed a bag of Doritos right before he was called to the set.… Now everyone knows they didn’t have Doritos in 1836. So the actor shoved the bag into his costume and got ready to go out in a blaze of battlefield glory. Of course, when he fell, the Doritos bag slipped out, the camera caught it, and they had to reshoot the whole scene. During the same Texas conference, some government officials felt compelled to do some filming of their own. Marty Wagner, acting administrator of GSA’s Federal Acquisition Service, knelt down a few feet from an armadillo to take a picture using his camera phone. Most of the other Washingtonians watched the creature from a safer distance.